One of the things I love about nail bloggers is the fact that every year, they do a BCA (breast cancer awareness) initiative in October. This year, it is #polishuspink on Instagram (if you search for the hashtag, you'll see lots of pretty pink manicures from bloggers doing their bit to raise awareness). Since here in Singapore, breast cancer is actually the top cause of deaths in women, I thought another BCA mani wouldn't hurt! My pink and girly BCA nails this year! 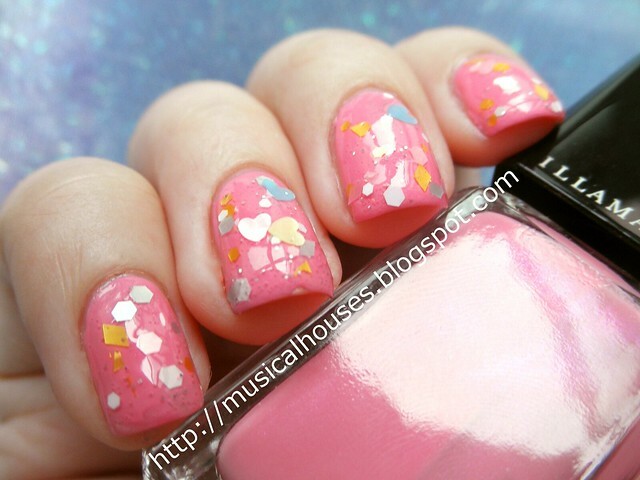 This time around, my mani is a simple one - no nail art, just glitter on top of pink. I had bought the Illamasqua polish in Loella during one of Illamasqua's online sales (the haul post for that is still sitting around in my Drafts folder, oops), and I had also bought the Etude House nail polish, WH901 Cotton Candy Kiss from their Dear My Nails range when my colleague went to Korea (they were cheaper there, and I couldn't resist asking her to get me a few bottles). Illamasqua Loella is actually not as pastel as I expected it to be. It was described as a cotton candy pink, and for some reason I kept thinking that this meant that I would be getting a light pink. Loella is indeed a cotton candy pink shade, but a little darker than I expected. Which is great, because this makes it a wearable light pink that doesn't give me corpse hands like a more pastel-y shade would have done. In fact, when I bought Loella, my sister was the first one to use it before I did, because she liked the colour so much! Application is smooth, as is with most Illamasquas I own. This is two coats you see here. It's a pink creme, but I do think in the bottle that there was the slightest flash of magenta at some angles, but it doesn't show up when applied on the nails, or in photos. 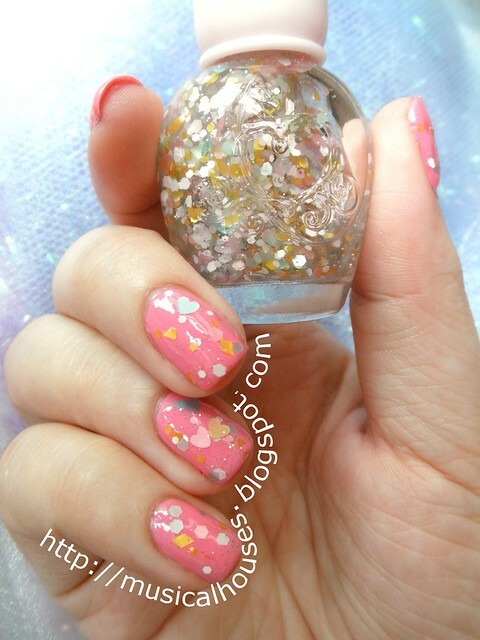 Etude House WH901 Cotton Candy Kiss is actually one of their polishes from the Summer 2013 glitters collection. I guess Etude House has noticed that indie glitters have been very popular lately, and they've been churning out their own indie-glitter-like shades! WH901 Cotton Candy Kiss isn't too bad - as a matter of fact I really like the combination of white and pastel glitters in a clear base. The glitters are of varying shapes and sizes - hearts, hexagons, diamonds, normal sparkly glitter, and so on, in shades of pale blue, pale pink, white, and yellow. Anyway, the only drawback to this polish is that the glitter isn't that dense, so you do need to fish around for the glitter bits, which is a bit of a pity. Otherwise, I really love the glitter combination. 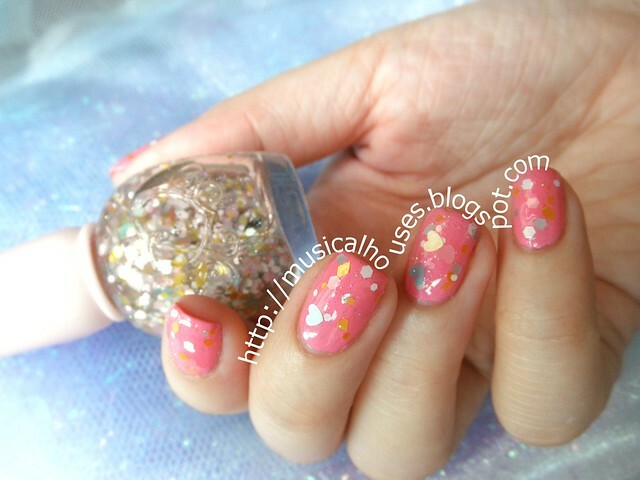 Illamasqua Loella + Etude House WH901 = Awesome Pink BCA Nails! Now that we're done with pretty polish pictures, allow me to remind you that with breast cancer, early recreation increases survival rates, so if you're in the at-risk age group (50 to 74), the best way to detect breast cancer is to get a mammogram once every 2 years. This year, you can get $20 off your mammogram before 31/10, so do get yourself checked out if you're at risk!